Tis the season for family dinners, work outings, and holiday parties. For many people, this means a social calendar quickly getting booked with one festive event after another. It’s a bustling, thrilling time of shopping and merriment. Regardless of the size of the event, make sure you plan ahead and bring a gift for the host. It’s a rule passed down from generations: never show up empty handed. You can keep the peace and avoid any social faux pas when you bring the host of a party a thoughtful gift. Just make sure to leave the overused, standard holiday gifts at home. Your gift is a way of thanking the host for having the event and demonstrating that you have good manners. A gift of fruitcake or a store bought gift package isn’t a sincere way to show your appreciation. 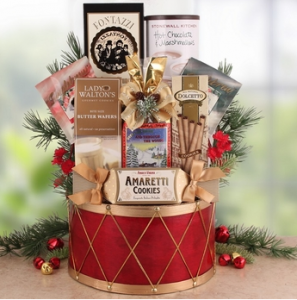 Politely offer the host a bottle of fine wine, some homemade holiday goodies, or even gourmet Christmas gifts from Bisket Baskets. Our themed Christmas gift baskets can be as simple or as extravagant as you desire. Our selection includes baskets with gourmet items, such as smoked salmon, caviar, cheeses, sweets, and other special gourmet goodies. You’ll know you left a good impression at the last soirée if you took your gift giving to the next level by bringing gourmet Christmas gifts from Bisket Baskets. Shop today and get baskets for all of the events on your calendar. Do you have friends that are hard to shop for? Or what about family members who have very specific tastes but never quite communicate what they want for Christmas? We’ve all been there, and that’s why Bisket Baskets has a large collection of unique holiday gift baskets for you to choose from. Pizza Lovers – Do you have a friend who is always thrilled with the idea of staying in and ordering pizza? The Holiday Pizza Oven Gift is the perfect item to surprise them with. From the Mountain Lodge Pizza Crust Mix with rosemary and basil to the snowman oven mitt and towels, this gift is certain to leave any pizza lover satisfied. Pet Lovers – For the friend or family member who is always pampering their pet, choose a pet-themed Christmas gift basket. There are plenty of baskets for the dog or cat owner in your life. Choose from baskets filled with items like treats, bones, and other pet toys to make sure the four legged friends of the family have a wonderful holiday. Some gifts even include goodies for the pet owner too! Candy Lovers – From fruity flavors to rich chocolate decadence, candy is something people always get excited about. Spoil the chocolate lovers in your life with the M&M’s Gift Basket or Reese’s Candy Gift. There’s even baskets that feature Skittles and snack foods for the ultimate junk food gift. Our unique holiday gift baskets are ready to go! 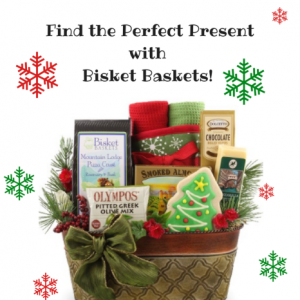 Visit BisketBaskets.com today to find the perfect gift for everyone on your list.